causes the cover to rip. Once exposed the internal components are vulnerable and can easily blow out from their structure. 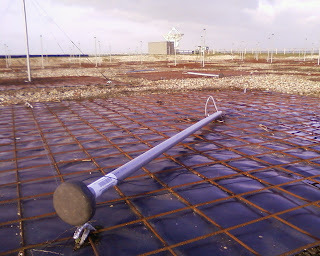 There was also damage on the Low­Band Antenna (LBA) array . For the most part, this was collateral damage caused by HBA components being blown into the area. However a number of the aerials also failed in their own right. Again, this was due to ground anchors coming loose. Even in cases where the anchors held, bent steel grids still results due to unsecured sides lifting up in the 25+m/s gusts. 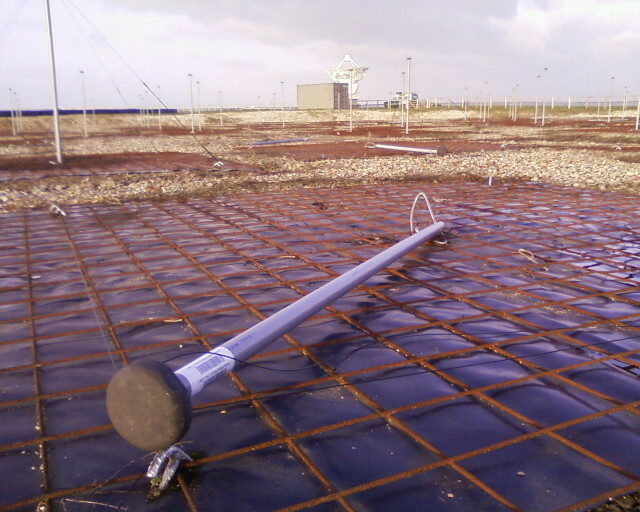 The small, round discs at the top of the LBA antennas are the critical part. They contain the low-noise amplifier (LNA) for each of the two polarisation channels and this is where the antenna dipole wires themselves are attached. Within weeks the UK station, which was where I was working at the time, had been repaired and was operational again. 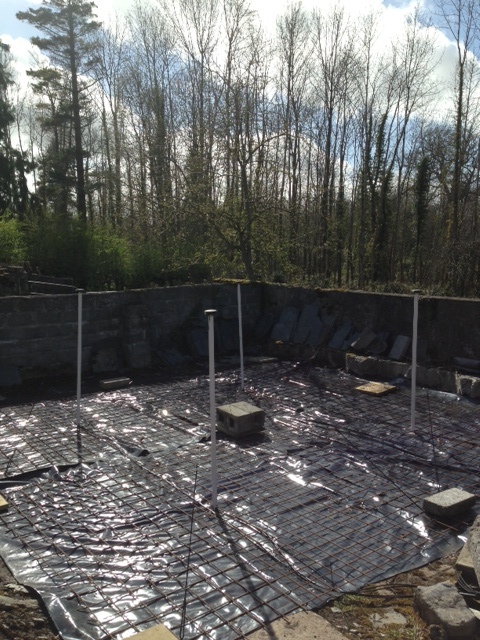 The damaged tile had been fixed and the destroyed LBAs had been replaced. The mauled LBA LNAs were kept, but it was highly unlike that they could ever be repaired. 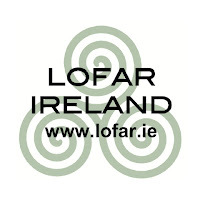 A few months later, I had been invited to Ireland to give a lecture and attend some meetings about LOFAR. 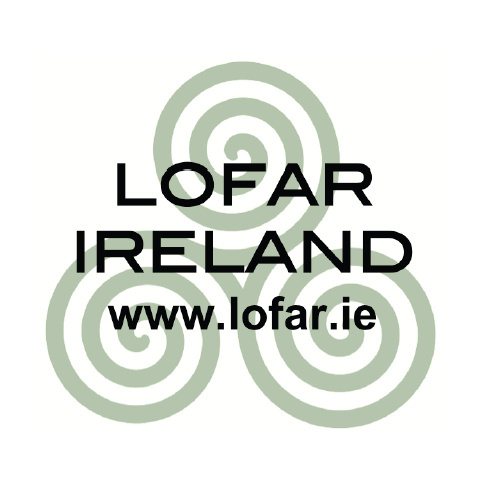 There is a consortium in Ireland (I-LOFAR) which are planning to purchase a full LOFAR station to be located near Birr Castle. At the time, I recall discussing the storm damage from the UK station, and we talked about whether it would be possible to do anything with the damaged parts. 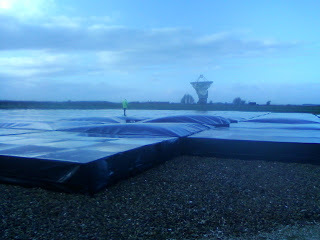 We felt that we should give it a try, and four LBA LNA units were sent from the UK to our I-LOFAR colleagues. 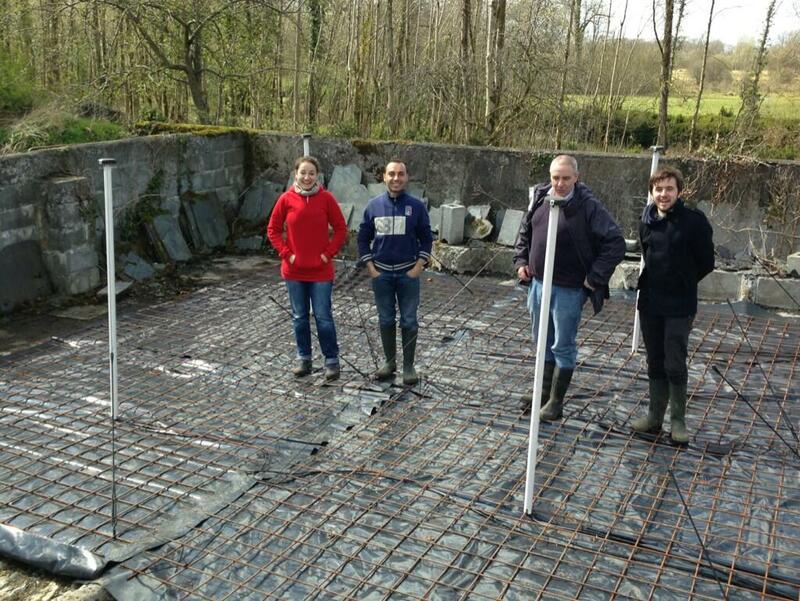 Well, that was about a year ago and this week, we were delighted to learn that the I-LOFAR team have managed to get them repaired and have built a small 4-element array. For those who follow our weblog regularly, you may recall that we ourselves have built a 4-element array at Pittiövaara. So now, Ireland have one too. 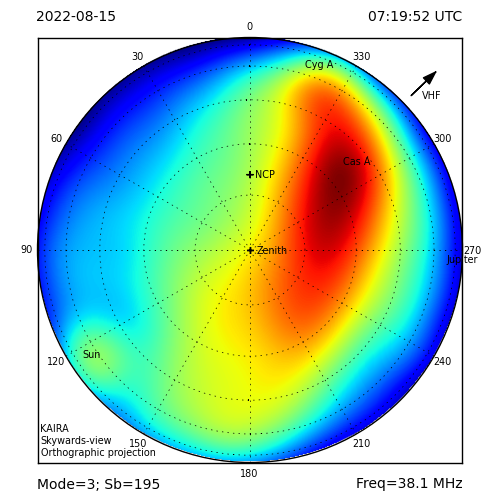 There are several of these "micro-LOFAR-stations" either built or under development and it will be interesting to watch progress over the coming years, not just in terms of technical achievement, but also in terms of scientific observations. 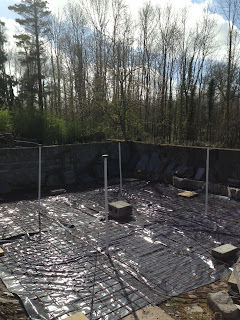 Here are some photographs of the recent work at Birr, Ireland, showing the completed 4-LBA micro-LOFAR-station that they have constructed with the recovered parts. The next step for them now is to get the electronics installed and operational. Once that is done, and the data acquisition system is ready, then they can commence their first observations. But of course, I-LOFAR have ambitious plans for their project. 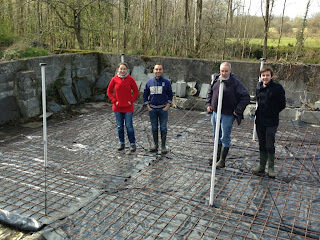 In addition to this development described here, they are currently trying to raise funds for a full LOFAR station. 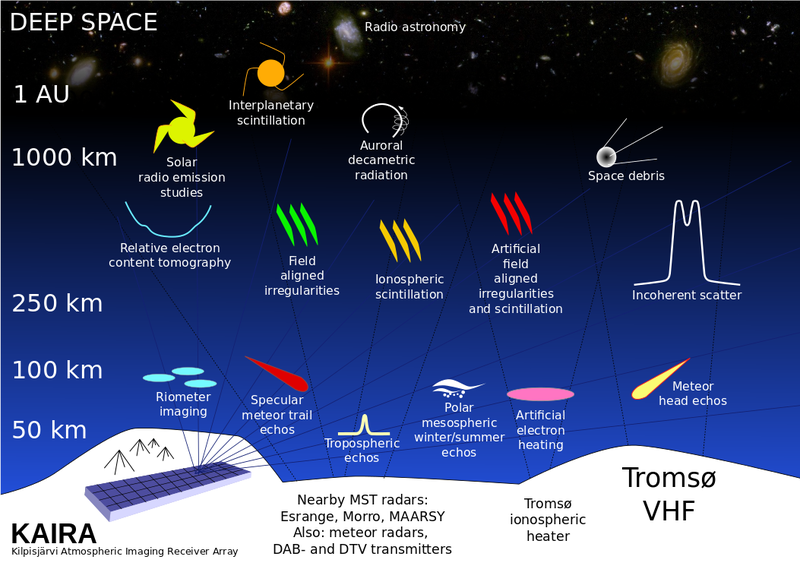 This will not only bring their researchers to the forefront of astrophysics and technology research, but will provide educational outreach in mathematics, physics, and technology to students of all ages. It will also re-establish Ireland as a major contributor to modern scientific endeavour. So, we congratulate them on their achievements so far, wish them well for the next stage of their exciting project, and shall look forward to their first results!